Over the last couple of days, we have seen almost every U.S. carrier announce some sort of delay for their shipments of the Samsung Galaxy S3 (our review) to both stores and consumers. 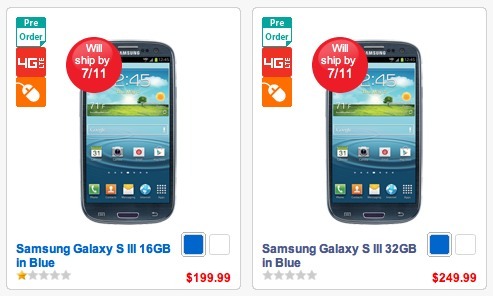 Thanks to high demand, Verizon can be added to that list, with their estimated shipping date now showing as 7/11. One thing we want to make clear though, is how this affects those that pre-ordered long ago. According to info we received, this new 7/11 date only applies to those that pre-order from today on or potentially within the last couple of days. If you pre-ordered between 6/6 and 6/13, yours should still ship by 7/9. If you pre-ordered between 6/14 and 6/18, yours should ship by 7/10. Cheers zepfloyd, ___, and J!